Dawn prayer (Fajr) - 2 Rak'ats. Midday prayer (Zuhr) - 4 Rak'ats. Afternoon prayer ('Asr) - 4 Rak'ats. Dusk prayer (Maghrib) - 3 Rak'ats. Night prayer ('Isha) - 4 Rak'ats. Friday prayer in place of Zuhr (Jumuah) - 2 Rak'ats. Between Isha and Fajr, a prayer called Tahajjud was regularly offered by the Prophet. It was obligatory for the Prophet. Devout Muslims try to follow the practice. Muslims also pray additional Rak'ats other than Fard and Sunnah. These are called Nafillah (optional). From the beginning of sunrise until 15-20 minutes later. When the sun is at its height (Zenith or Meridian). From the beginning of sunset until it is fully set. "I offer, the _________ prayer (name of a particular prayer), of ______ rakats (number of rakats), wajib Qurbatan Ilallah, (seeking nearness to Allah, in obedience to Him"). To stand erect facing the qibla (The Ka'aba) while saying Takbiratul Ehram, and to stand before the Ruku. I commence with the Name of Allah - in Whom all excellences are combined and Who is free from all defects. The Compassionate - One Whose blessings are extensive and unlimited. The Merciful - One Whose blessings are inherent and eternal. Praise be to Allah, the Sustainer of the creation. The path of those whom You have favored - the Prophets and their successors. in the first and second Rak'ats, and thereafter one should, on the basis of precaution, recite one complete Surah (in this case Surah-Ikhlas). Say: Allah is One - the Eternal Being. Allah is He Who is independent of all beings. And none in the creation is equal to Him. 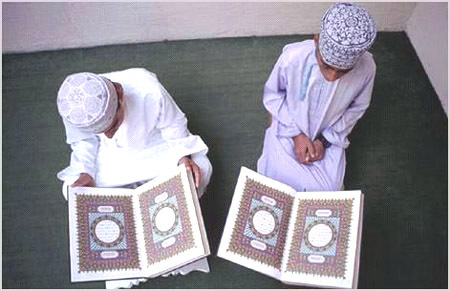 In every Rak'at, a person offering prayers should, after reciting the Surahs (Qira'at), bow to an extent that he is able to rest his finger tips on his knees. This act is called Ruku. Subhana Rabbiyal 'Azimi wa bihamdih once. Sajdah means that one should place one's forehead on earth in a special manner, with the intention of humility (before Allah). A person offering prayers should perform two Sajdahs after the Ruku, in each Rak'at of the obligatory. "Astaghfir-oolaha Rabbee wa Atoobo Ilaih"
(I ask Allah, my Lord, to cover up my sins and unto Him I turn repentant). "Bay Hawlillahay wa Qoowateyhee Aqoomo wa Aqud"
(Due to the vigour given by Allah and because of the vitality from Him I rise and stand). Recite Surah Al-Hamd and Other Surah of Holy Qur'an as in the first rakat. "Ash hadu an la ilaha illal lahu wahdahu la sharika lah, wa ash hadu anna Muhammadan 'Abduhu wa Rasuluh Alla humma salli 'ala Muhammadin wa Ali Muhammad"
and then stand up for the third rakat. "Subhanallahi wal hamdu lillahi wa la ilaha lallahu wallahu Akbar"
(Glory be to Allah, and all praise is for Him and there is no one worth worshipping other than Allah, and He is Greater than any description). recite the zikr, stand up momentarily and then do the two sajdah's (just as in the first rakat) and thereafter recite the Tashahhud (just as in the second rakat). and then stand up for the fourth rakat. recite the zikr, stand up momentarily and then do the two Sajdahs (just as in the first rakat) and thereafter recite the Tashahhud.